There are many paper cards for learning foreign languages. But they all have low efficiency. You have to look through them and repeat foreign words many times. It’s boring. Long. Slow. And what if you try to solve logical puzzles with foreign words. Simple puzzles. The cards use several types of logical problems with different algorithms. It’s unusual. But it is effective! New version of cards for learning foreign languages. Cards use the OFLAMERON method to effectively memorize foreign words and phrases. Such cards are more interesting and more efficient than ordinary flash cards. You can download several hundred ready-made cards in PDF format and print to a printer. Cards can be printed on any printer. 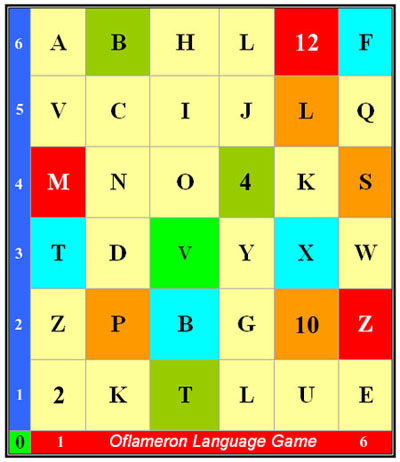 Each card contains a foreign word in which some letters are missing. The student must enter the letters in the card to get the correct foreign word. For each word there are 4-5 options. New cards are added periodically. Special cards for learning German words or phrases. These cards are special. They are more interesting, more complex and more effective than ordinary flash cards. You can download PDF and print any number of cards for free. Board game with special cards for learning foreign languages. A small card with a foreign word. Some letters are replaced by a “?”. There’s a translation on the card. Can you guess the foreign word correctly? If you want to get advantage, use special flashcards. You need to solve simple logic problems for 1-2 minutes. It is interesting and words are memorized effectively.